Glory to Thee, O Lord! 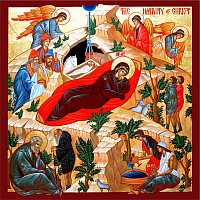 Once again we greet the awaited bright days of Christ’s Nativity. Let us be glad and rejoice. In order to raise our festivities to a higher level in these days, the Holy Church has intentionally instituted a preceding fast—a certain amount of difficulty, so that when we enter the festive period we might feel as though liberated. Nevertheless, the Church in no way desires that we should give ourselves over to purely sensual delights and fleshly pleasures. Since the Church has from olden times called these days sviatki, or the “holy days,” these days require that our very festivity be holy, as they are holy. So that those who rejoice might not forget themselves, the Church has placed a short song upon our lips to glorify the born Christ, by which the flesh is restrained and the soul is uplifted, showing the proper occupations for these days. It says, “Christ is Born, give ye glory,” and the rest. Glorify Christ; glorify Him, so that by this glorification the heart and soul would delight, and thereby silence any urge for various other deeds and occupations that might promise certain consolations. Glorifying Christ does not mean devising lengthy songs of praises to Christ. But if when contemplating or hearing about the birth of Christ the Savior you involuntary shout from the depths of your soul, “Glory to Thee, O Lord, that Christ is born!”—this is sufficient. This will be a quiet song of the heart, which nevertheless reaches the heavens and enters in to God Himself. Repeat a little more clearly to yourself what the Lord has wrought for us, and you will see how natural this exclamation now is. So that this might be easier for us, we shall compare it to the following incident. A king promised freedom to a man who was imprisoned in a dungeon and bound with fetters. The prisoner waits a day, then another, then months, and years. He sees no fulfillment of the promise, but does not lose hope, and believes in the king’s words. Finally, he sees signs that it is coming soon, his attention increases—he hears a noise; some one is approaching with cheerful words. Now the locks fall and the liberator enters. “Glory to Thee, O Lord!” the prisoner involuntarily cries. “The end of my imprisonment has arrived, and soon I will see God’s world!” Or another incident: A sick man is covered with wounds and paralyzed in all his members. He has tried all medicines and various doctors. His endurance is exhausted, and he is ready to give himself over to despair. He is told, “There is one very skilled doctor who heals everyone from those very illnesses that you have. We have asked him to come, and he has promised to do so.” The patient believes them, cries out in hope, and waits for the promised one…. One hour passes, then another, and his soul is tormented with anxiety. Finally, at evening, someone arrives…. The door opens, and the desired one enters…. “Glory to Thee, O Lord!” the sick man shouts. Be a virgin, my soul!